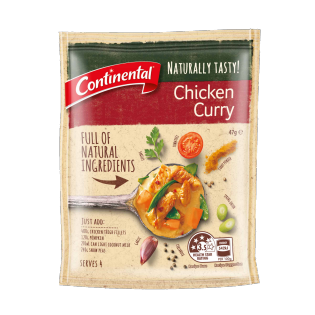 Continental Naturally Tasty Chicken Curry is a recipe mix full of natural ingredients, so you can create a delicious meal the whole family will enjoy! Corn starch, vegetables (34%) (onion, tomato powder, red bell peppers, mushrooms, spring onions), salt, rice flour, curry powder (3.9%) (coriander, cumin, turmeric, pepper, aniseed, cinnamon, fennel seed, ginger, lovage root, cayenne pepper, allspice), spices (ginger, coriander, fenugreek seed, celery seed, garlic powder, pepper, nutmeg), corn oil, sugar, parsley, lemon juice powder. Wow....this is the best. Was tasty and full of flavour. I used breast fillets because I am not fussed on Thigh Fillets. Will definitely buy this product again. Thanks Continental.